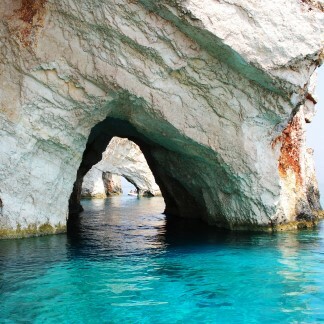 Enjoy a boat ride to the unique Blue Caves or the world famous Shipwreck Cove, two of the top sights you must visit when in Zante. Why not visit both and make a day of it? Visit the Blue Caves and the Shipwreck Cove in one of our 5 glass bottom boats, the smallest is suitable for up to 20 passengers and the largest can can take up to 50 people. Our boats run every 15 minutes from early in the morning until the evening. Whether you choose the first boat at 9 am or the last one at 7:30pm the experience will be unforgettable! Enjoy a memorable stay at one of our original stone windmills or traditional stone rooms and apartments that can accommodate up to 2 or 4 people! 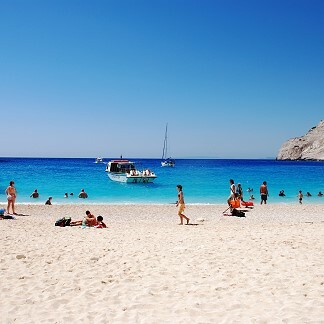 We hope to welcome you to Zakynthos and the picturesque area of Skinari. We are a family run business, owned by three brothers, Adonis, Dionisios and Nikolaos. We have two windmills, two traditional stone rooms and a stone apartment where you can enjoy a lovely stay overlooking the endless blue of the Ionian Sea. Next door you will find the Windmill Snack bar and 200 meters away the Faros Taverna owned by the same family. Our family also offers boat trips to the famous Shipwreck beach or Navagio as it known in Greek and the Blue Caves in glass bottom boats. 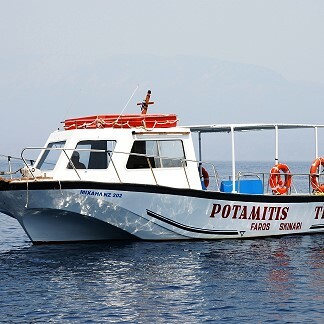 It is an exceptional way to see the underwater world of Zakynthos. Book your trip to the Shipwreck and the Blue Caves at the low rate of 20 euro per person! Your visit to Zakynthos will not be complete without taking a boat trip to the amazing Shipwreck Cove and the Blue Caves. Whether you prefer a group excursion or a private cruise, the Potamitis Brothers guarantee the experience will be spectacular!